I grew up in a family where money was tight. My family was frugal, we drove our vehicles till they fell apart, we wore second hand clothing, we gardened, we canned, but I remember we were also a family with a closet full of books. Sure it would have been more frugal to stick to library books only, but having those books available to me 24/7 instilled in me a love for them. I may not have read as much as others when I was little, but I remember many a summer day curled up under the shade of a tree reading a book off the shelf. Now that I have children of my own, and we are a homeschooling family I feel the need to make sure I also make owning a collection of our own books a priority.We have two book cases, one filled with non fiction books and the other with works of fiction. We also have a shelf full of comic books, and stacks of magazines lying around here and there. 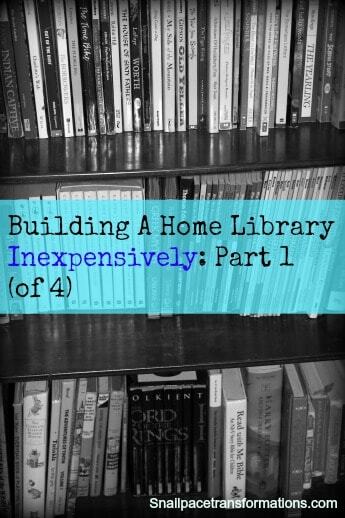 I build our library frugally. Having books does not have to be expensive. If you are absent minded like me, it may even be done for less than what you pay your library in over due fees every year (okay maybe not less but some days it sure feels like it). I originally planned this as a one time segment but when I started typing about how many different ways to save money on books, magazines and audiobooks the post became too lengthy, so make sure to come back the next few Fridays, to read part 2, part 3 and part 4. Yard sales are my number 1 source for inexpensive books. In fact when I walk up to a yard sale they are the first things I look for. Most soft cover story books are between .25 to .50 cents in my area. A current bestseller hardcover work of fiction might go for $2. I usually come home with a stack full of books every community sale I hit. Thrifty tip: If you have a stack of titles you want in your hand, total their value in your head and then haggle with the seller for a discount. I usually say “I have $5 worth of books here would you take $4” rarely do I get turned down. If I am looking for a particular title, I might head into a second hand book store. Prices are more than yard sales but still significantly cheaper than new. Thrifty tip: Bring your own books you no longer read with you and trade them for store credit. Thrift stores vary from town to town as to how many books they might have. Prices will also vary from store to store as well as selection. The key is to drop in once or twice a month to see what is new on the shelves. Thrifty tip: Often thrift stores will have a regular half price day. This is a great way to get your books for even less. Kindle edition books are often less expensive than their paper cousins but what I love about Kindle the most is the free titles. I highly recommend getting yourself a free kindle app. account. You don’t need a Kindle to download the books (although my husband loves his kindle fire). I love to read my free Kindle books on my netbook, through my kindle cloud reader account. I also download a few for on the go reading using the kindle app. on my iPod. Thrifty Tip: 100’s of classic titles are free on Kindle. If you are not into classic titles, try punching in the words “best sellers” into the kindle store section of Amazon. What should pop up on your screen is a list of the “Top 100 Paid” as well as a list of the “Top 100 Free” titles right beside it. The blog Money Saving Mom also lists great free kindle titles. I suggest checking out her free e-book page which can be found in the freebies and giveaway tab at the top of her site. Even if you don’t homeschool you may want to check out the second hand curriculum sales in your area. They are a treasure trove of non fiction and fiction books. The prices will be comparable with what you will find in second hand book stores, but the selection for children will be better. Thrifty tip: Often if you go during the last hour of the sale, you will find people slashing prices, since books are heavy and they don’t want to lug them all back out to the car. However, selection will be slimmer than if you go early, so it really depends on how badly you want particular titles before you consider doing this tip. These are just a portion of my tips on how to build an home library in a frugal way. Please come back next Friday when I will list more tips on building a home library for less. This post is linked to The Weekly Round Up at It’s a Blog Party, Hip Homeschool Hop at Hip Homeschooling Moms, Tackle It Tuesday at 5 Minutes for Mom , WLWW at Women Living Well, WFMW at We Are That Family , Proverbs 31 Thursdays at Raising Mighty Arrows and Frugal Fridays at Life as Mom, The Mommy Club at Crystal and Co.
Hi! I’m visiting from It’s a Blog Party. I love buying second hand books and always donate mine, too. I rarely keep fiction books to read again unless they’re old tried and true titles. This is a GREAT post! Thanks for all the ideas. I am a book lover as well as a frugal homeschooling mama. I will have to put some of your ideas into practice. You probably already know this since you are planning to post more, but have you heard of paperbackswap.com? It is one of my favorite places to get free books (and get rid of older ones I no longer have a use for). Your right I use paperbackswap it will be one of the things I mention next week. I love using it to get books off Sonlights reading list. I am glad you enjoyed the post. We love books too! Do you have frugal ways to STORE them? LOL I just purged about 1000 books to donate to our local library, keeping favorites, collections, those with personal notes or signed inside, and old ones. It was hard to do it, but we’d run out of space and couldn’t enjoy our gems! Wow that was a huge library! I know the feeling though, I have to give our library space limits otherwise it starts to take over! Come check out my list of 100 Smoothies! Comment if you’d like on which one is you favorite! Thanks for pulling this together and sharing it. I’m looking forward to reading the following posts. As a former homeschooler, I saved a lot of the books I used with my oldest, and now my other 4 are reading them. We also visit the library a LOT. Thanks I will start linking up next weekend.